Winning moment for GISS Improv team at the Canadian Improv Games in Ottawa on Thursday, April 4. 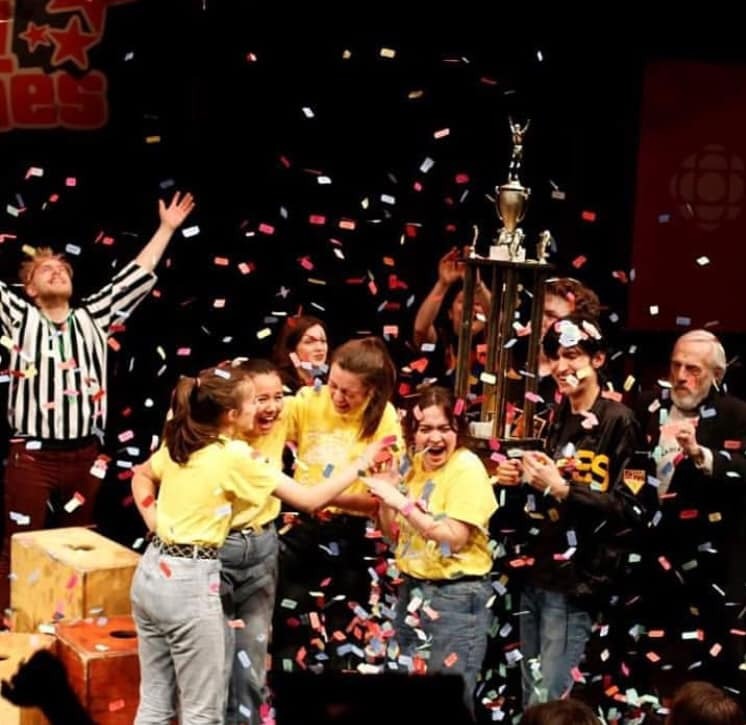 It’s gold once again for the Gulf Islands Secondary School senior improv team, who returned from the Canadian Improv Games on Friday as the new reigning champions. The win marks the third time in three years that GISS has produced a medal, with their first national championship win in 2017 followed by a silver medal finish last year. The core members of the 2018 team — Calla Adubofour-Poku, Kahlila Ball, Jo Gaffney and Amelia McCluskey — returned this year and were joined by two musicians, Jacob Culling and Calum Duncan. Another year of developing and deepening their skills, a commitment to their training and the new musical collaboration proved just the right combination to take the lead in Ottawa. The full week experience included a number of workshops and social events, plus the requisite trip to Parliament and the major museums, and even a side trip to Montreal. GISS had its preliminary round slot on the first of three nights and scored substantially higher than the other teams, both in that group and on the two following nights, ensuring their place in Thursday’s finals. “We really did some inspired work in the preliminary rounds that scored amazingly well,” said coach Jason Donaldson.